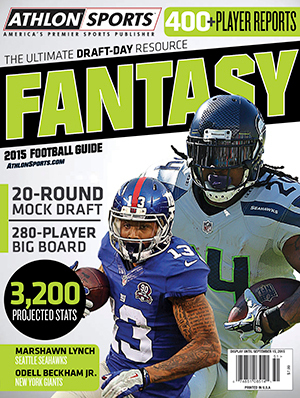 With NFL training camps cranking up, that means the 2015 fantasy football season is just around the corner. And when it comes to a fantasy draft, it all starts with the No. 1 pick. Entering 2015, the race for the No. 1 overall pick appears to be as wide open as it has been in recent years, thanks in part to Le’Veon Bell’s suspension, which upon appeal was reduced to two games. Pittsburgh’s All-Pro running back led all non-quarterbacks in fantasy points, but there’s a pretty big difference when it comes to the possbility of missing three games to the reaility that he will miss just two. How big of a difference you ask. Big enough that a number of Athlon Sports editors and fantasy football contributors weren’t in complete agreement when they were asked who they would take with the No. 1 overall pick. A strong argument can be made for a couple of RBs at the No. 1 spot, but I have to go with Bell. Sure, the early suspension limits his value and will require a little patience from fantasy owners. However, the All-Pro finished second in the league with 1,361 rushing yards last season and ranked No. 2 among running backs by catching 83 passes. He also totaled 11 overall scores in 16 games. Who’s No. 1 this year? I hope I’m not drafting in that spot. But if I need to pick someone ... it’s still Le’Veon Bell. In PPR leagues, Bell finished among the top 24 running backs every single week last season. He’ll remain Pittsburgh’s workhorse and one of the league’s best receiving backs when he takes the field this year, so a repeat in that category seems possible. Thirteen fantasy-starter weeks would have still beaten every other back in the league last year besides DeMarco Murray and Matt FortÃ©. So why not favor those guys? Murray moves to Philly, where he’ll probably fall well short of 300 carries. (Chip Kelly has said he doesn’t want to over-work Murray.) FortÃ© loses Marc Trestman’s reception-heavy scheme, which threatens to reveal an aging back who gained just 3.9 yards per rush last year. If not for the two games that Le’Veon Bell will sit out at the beginning of the season, he would be my no-doubt No. 1. As it is, instead I’ll go with Bell’s 2013 draft classmate, Eddie Lacy. Last season, Lacy finished seventh in rushing with 1,139 yards. What’s more important, however, is that he raised his yards per carry average from 4.1 as a rookie to 4.6 in 2014. Le’Veon Bell’s two-game suspension alone doesn’t scare me off, but it has to be considered. His receiving production was also off the charts last season; it nearly matched his rushing total from the year before. That’s unlikely to happen again. So looking elsewhere, I find myself down to two Green Bay Packers: Aaron Rodgers and Eddie Lacy. Rodgers is a sure thing, the best quarterback in the game with all kinds of weapons around him in a system which has brought him success. Thing is, there are plenty of quarterbacks who can get you numbers; if you wait until the end of Round 2 to take a back, you might not like what’s left. With the first pick in a 2015 fantasy football draft, I am going to take Adrian Peterson. Let me preface my rationale by saying that I understand the arguments for at least three other guys, however, give me Peterson. Yes, he missed last year, but it was not because of injury. He's as healthy as he could be (and reportedly in great shape at training camp), he's motivated to show the league how good he is, and he is on a team that can put together a high-powered offense. Looking at some of the top running backs from 2014, it’s relatively easy to come to the conclusion that Charles should be the No. 1 overall pick again in 2015, much like I said last year. DeMarco Murray changed teams. Le’Veon Bell is automatically out a few games from suspension. Charles, meanwhile, runs behind an offensive line that is still jelling, and he was still able to rush for 5.0 yards per carry last season. This has been one crazy summer, and there’s no Bobcat Goldthwait. There also is no clear No. 1 pick in fantasy football, in all honesty. Adrian Peterson is coming off a lengthy absence and has reached the dangerous age of 30. Le’Veon Bell is coming off a late-season knee injury and is suspended for the start of the season. Marshawn Lynch had back issues last year and is now 29. DeMarco Murray heads to Philly, where LeSean McCoy struggled last year and where Ryan Mathews might also be sharing touches. This is the most wide-open race for No. 1 that I can remember. Every player in the conversation has massive upside, but all have question marks as well. Le’Veon Bell is going to miss two games due to suspension. Jamaal Charles, Eddie Lacy, Arian Foster and DeMarco Murray have injury concerns. And there is too much depth and value to take a quarterback.